Try this fun way to serve your grilled cheese and you can dunk it! Place Kraft Singles pieces on centres of bread slices; roll up tightly. Spread with margarine; place, seam sides down, on parchment-covered baking sheet. Bake 10 to 12 min. or until golden brown, turning after 6 min. Top each Singles piece with a thin slice of your favourite deli meat (cut or folded to fit bread slice) before rolling bread up and baking as directed. 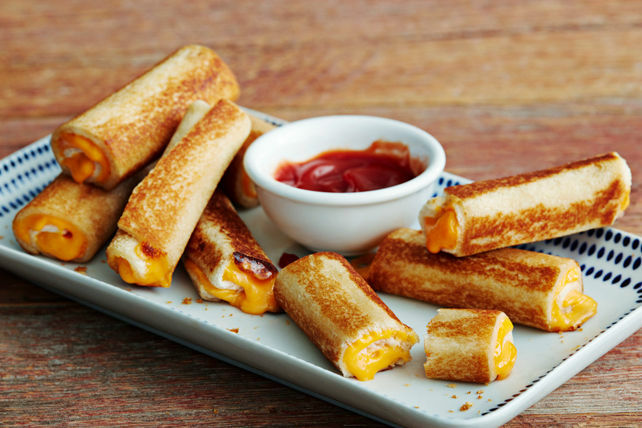 Prepare using Kraft Singles Mozzarella Cheese Slices. Serve with warmed Classico Pasta Sauce.